To some of us, Ron Judd writes, tufted puffins are “living, flying proof” that Mother Nature has a sense of humor. To others, they’re an irresistibly beautiful gem. 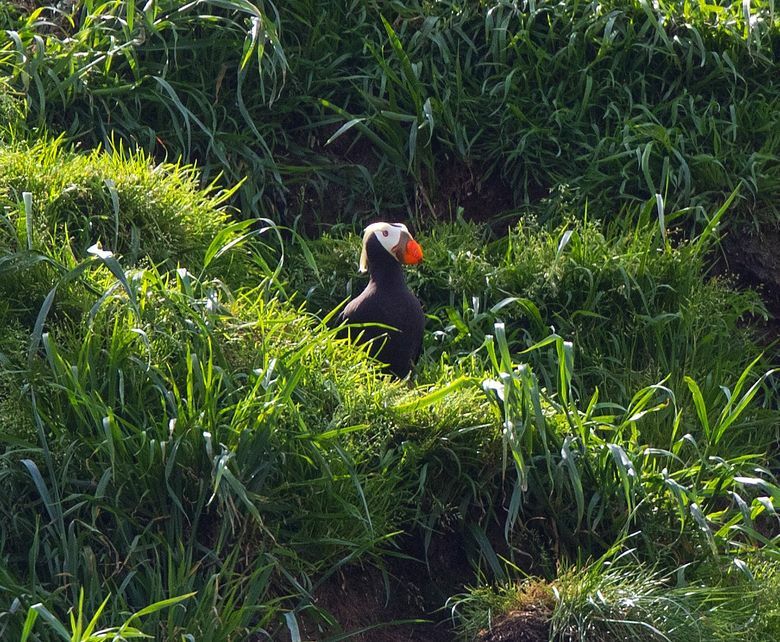 But if you’d like to see these quirky creatures outside a zoo, “get a move on: Places that afford those opportunities are shrinking every year.” One of those places is Oregon’s Cannon Beach, where a puffin stands outside a nesting burrow near the top of Haystack Rock. Young birds take their first steps into life there by literally jumping off a cliff. Learn more and enjoy the photos,which were rather challenging to take. Traffic alert: Interstate 5 northbound will close entirely at Sodo for more repairs from tomorrow night until early Monday. And that’s not all the fun: Weekend roadwork also will close Highway 2 westbound from Lake Stevens to Everett, and lanes of I-90 between Issaquah and Snoqualmie Pass. Know what’s closing, check traffic here — or just stay home. Two motorcyclists died after colliding with a car at high speeds last night on Highway 104 in Shoreline. Interim Seattle Police Chief Carmen Best wasn’t among the finalists for the top-cop job back in May. But after a stunning reversal, she’s now the front-runner. Read our profile of Best and catch up with the ones we’ve done on finalists Eddie Frizell and Ely Reyes. The three spoke to a skeptical and boisterous crowd last night in a panel discussion, saying they won’t hesitate to hold officers accountable and won’t tolerate biased policing (watch video highlights). Blow the dust off your shades and sunscreen: The Puget Sound’s true, short season of summer has arrived. Burn bans go into effect today in Kitsap and Pierce counties, with Skagit County following tomorrow, as temperatures soar across the region. We may see a bit of cooling tomorrow before Mother Nature fires the oven up again for the weekend. The #SendSegura campaign run by the Mariners paid off: Shortstop Jean Segura has won the MLB’s final vote for the American League All-Star team after an aggressive social-media approach and a flood of fan help. Segura says he’s humbled and making plans for his wife, mom and kids to share the experience. 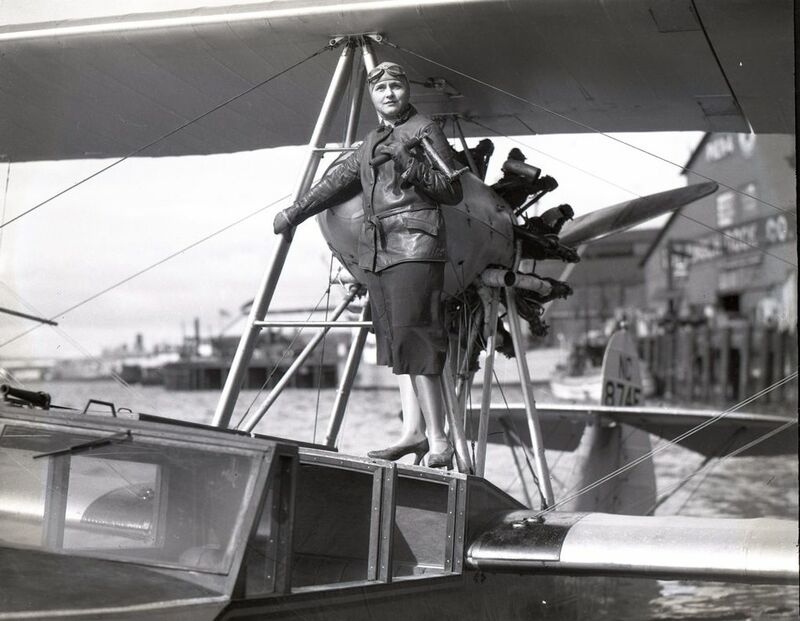 Pioneering aviator Gertrude Hartman had a very busy day in April 1931. First she rescued her fellow flyer just before their biplane went up in flames. Then she saved a woman and a baby from an exploding barn. Hartman broke her arm amid all of this, but maybe you can guess from her determined look what happened when firefighters offered aid. (And oh, those heels!) Fly along for a tale that could be a Hollywood blockbuster. Costco is in hot water with fans of the Polish hot dogs that are being nixed from food-court menus. The company is amazed at the outpouring after many vented their displeasure on social media with #SaveThePolishDog, but will it make a difference? And that’s not the only menu change drawing strong reactions. It’s on: Seattle police have accepted a lip-syncing challenge from the Virginia cops whose video went viral. “Mrs. Seahawk” will not soon be forgotten by the team. Original Seahawk employee Sandy Gregory has retired after 42 years with the franchise, many of them as the point person for Seahawks appearances. Quarterback Russell Wilson called her “a legend,” and former quarterback Trent Dilfer dubbed her “one of the greatest Seahawks of all time.” She shares her favorite memories. Waste not: A Canada woman and her young son cut their weekly trash down so much that it fits into a small jar. She’s eating more healthily and enjoying her home more as a result. Here’s how she did it, and some quick changes the rest of us can make. Speaking of waste, columnist Jon Talton writes about how bans on plastic straws are tackling the mere tip of a gigantic iceberg. The affair, the son, and the cousin who came to dinner: When columnist Nicole Brodeur and her niece took an Ancestry.com test late last year, they never expected to unearth a secret. But the pieces came together into a puzzle that became a family gift. Big news in the local food scene: Angela Stowell will step down as CEO of Ethan Stowell Restaurants, and become the new CEO of nonprofit FareStart.”It’s an ideal match for keeping the momentum of a great thing going,” writes food reporter Bethany Jean Clement. President Donald Trump today jolted the NATO summit, threatening to “do his own thing” if allies didn’t increase military spending. It worked, he says:“Everyone’s agreed to substantially up their commitment.” Details on that weren’t immediately clear. (Here’s a fact check on Trump’s statements yesterday at NATO.) His next stop is London, where elegant events will keep him away from protesters who are flying a giant angry-baby-Trump balloon. On Monday, he’ll be in Helsinki, where he says he’ll talk with Russian leader Vladimir Putin about election meddling. That’s a lot of baseball tickets: Supreme Court nominee Brett Kavanaugh piled up tens of thousands of dollars in credit-card debt by purchasing Nationals tickets, the White House says as it provides a look at his finances. The debt is paid off now. Snowflake, a cloud-computing data software company, has launched its products on Microsoft Azure, another boost for Microsoft as it competes with Amazon’s popular cloud service. The Seattle Times editorial board recommends voters re-elect Democrat Rep. Tana Senn for the 41st Legislative District, Position 1. She is a reliable voice for women and families in the Legislature and has also made her mark on business-related policies. Helloooo summer sun! High 82. Low 60. Sunrise 5:24. Sunset 9:05.